Get a quick and overall understanding of IDEF (Integrated DEFinition) along with its family of methods and the benefits to use them. What exactly is IDEF? How many business modeling methods are included in IDEF? And how do IDEF methods work? As a very useful tool to business, it is essential to have a better comprehension of IDEF. So this page will extend definition of BPMN, its family of methods and the benefits to use them. Definition - What is IDEF? IDEF (Integrated Definition) is a graphical Process Modeling Methodology used to implement systems and engineer software. These methods are used in data functional modeling, simulation, object-oriented analysis, and knowledge acquisition. IDEF is conceived and developed by the United States Air Force in the mid-1970s. It was developed as a standard method of documenting and analyzing business processes. Now this methodology is used as a regimented approach to analyzing an enterprise, capturing "as-is" process models, and for modeling activities within a business group. 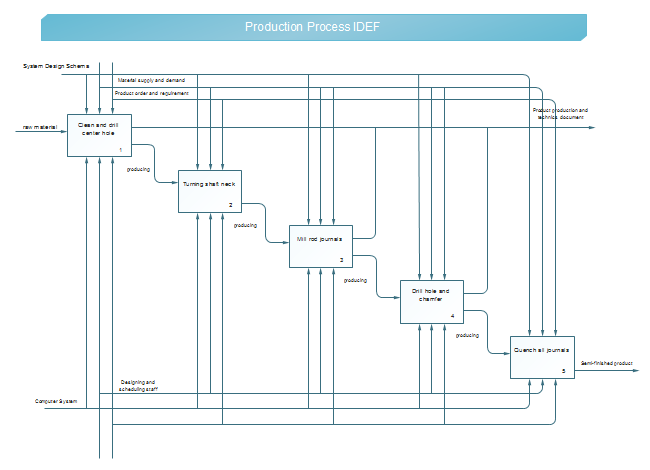 Even though IDEF was originally developed for the manufacturing environment, now this process modeling methodology has been applied for wider uses and for software development in general. IDEF refers to a family of modeling language, which includes 16 different methods. These process modeling methods cover a wide range of uses and each method captures a certain data type. 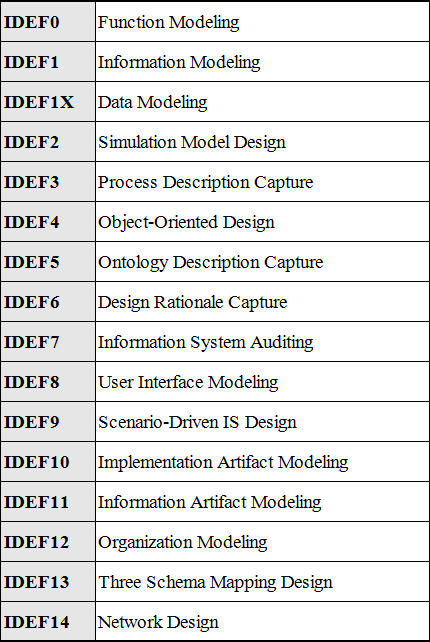 The table below lists the 16 IDEF methods. IDEF0 through IDEF4 are the most commonly used methods. IDEF0 through IDEF4 are the methods that are most commonly used. For example, for function modeling, IDEF0 is used to model the functions of an enterprise, create a graphical model that shows what controls the function, who performs it, what resources are used, what it produces, and what relationships it has to other functions. IDEF can be used in almost every possible context, industry or technology area. IDEF diagrams are easy to follow and read even without technical background. IDEF shows in detail a formal methodology for naming processes, diagrams and for providing feedback. IDEF0 can be used as an useful tool for process design while IDEF3 helps an mechanism to capture process information. IDEF0 contains a massive information and connect other parts together to show their impact on the process. IDEF3 gives you an overview of the process which allows you to ensure the solution is practical. IDEF0 enables you to see the value of the process output to make sure that the design is practical. 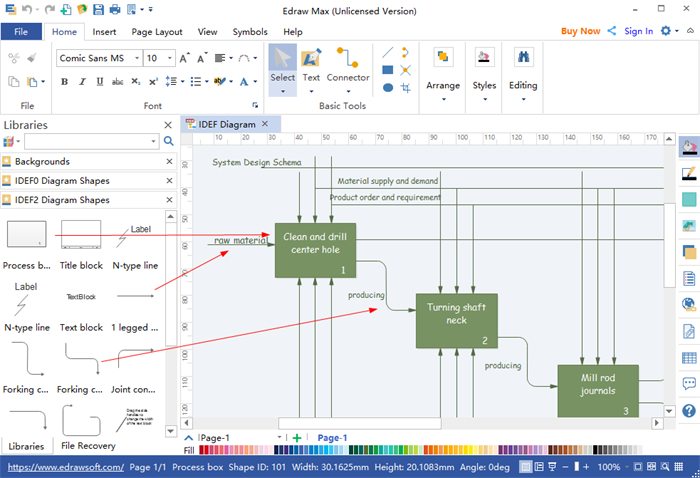 Edraw Max, an innovative IDEF diagram software, can help you create IDEF diagrams and business diagrams easily and rapidly with rich built-in examples and customizable templates.